I do not know how many times I have seen this film. It was a holiday staple growing up. For years, it was a Christmas Eve staple to boot, on while we wrapped gifts. I can recite lines of dialog, and do, sometimes unconsciously. “Out you two pixies go, tru da door our out da window” being one of my favorites. So, what was I thinking going to see it on The Big Screen? Well, I’ve never seen it on the Big Screen. The Flower never at all. And The Boy? Maybe part of it a long time ago. I’ve failed as a a parent. And the Big Screen makes a difference. People who don’t like this movie (or, as they’re known in the scientific literature, monsters) tend to not like it because it’s schmaltzy. And on the Big Screen, the opening seen is, well, it’s a lot. Zuzu is a lot. Almost too precious. I said almost. 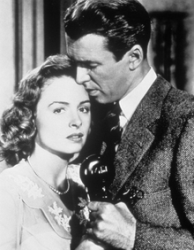 And the thing about It’s A Wonderful Life is, it earns its sentiment. In the first 90 seconds, the movie tells you exactly what’s going on: A beloved man is going through a hard time and people are praying for him. 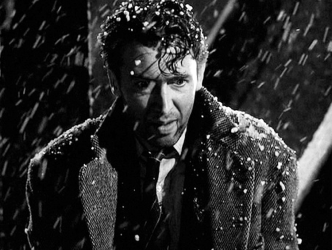 But then each frame of the film is designed to make you like George Bailey. He’s a decent fellow. He’s courageous, resourceful, imaginative and basically kind, though Lord knows, life gets him down. But the thing is, life doesn’t get him down for very long, it’s just this one moment in time where it looks like his life is really going to be over because of a mistake and an evil man, and he forgets in that moment how blessed he is. One of the sexiest scenes in movie history. The kids loved it. And seeing it in the theater, I noticed things I never had before. 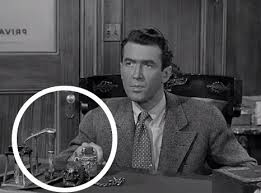 Like on Potter’s desk, when he’s offering Bailey a deal, there’s a skull attached to a chain. (Reference to A Christmas Carol, maybe?) I never noticed that after Mary tells George she doesn’t like coconut, and he calls her “brainless”, he follows up by spooning tons of coconut on to her sundae. I never noticed that the Baileys have an old model-T (or possibly model-A) even into the post-war period. I never noticed how many wrinkles 22 year old George Bailey had. (Jimmy Stewart was 35, I think) Heh. I’m not the first to notice the weird desk stuff, apparently. In my imagination, when the post-War prosperity really takes off, George gets to be pretty well off. Not too well off, because he’ll always be a bleeding heart. But well enough to spend his golden years travelling with Mary while kids run the Savings and Loan. Until the government shuts them down in the ’80s. Anyway. Still an American classic, and now one a new generation is enjoying. So there, haters.